The hurricane has past, the weather is clearing and the water is receding. That’s when the hazards emerge, as first responders and their crews enter the area. Fallen trees, downed power lines, flooding and storm debris are some of the visible hazards for crews during clean-up efforts after a hurricane or localized flooding. But there are many hidden dangers! 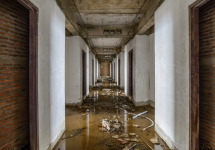 As cleanup begins in affected areas, workers and residents alike may unknowingly encounter hidden safety and health-compromising conditions, including contaminated water, polluted air, mold, contagious diseases, carbon monoxide, and insects. Being aware of such hazards allows individuals to protect themselves and their crews from dermal, inhalation, and respiratory exposure. First response contractors (FRCs) need to warn their crews to take proper precautions against these hazards. Risks can be minimized with training, safe work practices, and personal protective equipment (PPE). Industry standards and guidelines as well as Occupational Safety and Health Act (OSHA) Code of Federal Regulations (CFRs) provide solid guidance for personal protection and safety gear and practices. Before even responding to a hurricane or flooding disaster, it is important that all FRCs consult with a physician regarding required immunizations, such a Hepatitis A and B (some shots maybe a three-step process) and tetanus.